Hoppes Dri-Lube is designed for maximum lubrication but without a sticky or wet texture. Most oils, lubricants and CLP’s remain wet after they are applied and can attract dirt and other debris not to mention fouling. Hoppes Dri-Lube sprays on wet and dries quickly to provide a slick, dry film. It reduces friction on metal and bearing surfaces without a sticky residue. Dust and dirt will fall off or blow away. Dri-Lube comes in a 4 oz aerosol spray can. 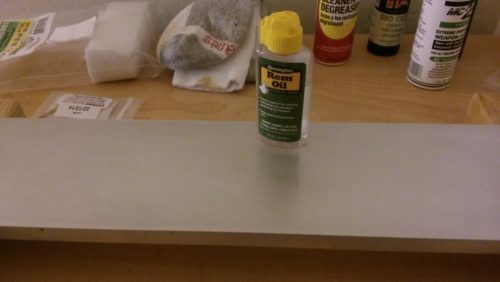 Froglube now has a gun oil….Froglube Extreme Oil. Froglube Extreme oil is designed more towards lubricating than cleaning and it does this very well. It’s temperature range is broader than the CLP…-44 F to 125 F. If your guns are subject to extreme cold or heat then you might want to take a closer look at this product. What is the recommended oil for the AR-15 Rifle? Gun manufacturers do not recommend any name brand oil for use on their guns. For obvious reasons. I have owned 3 AR-15’s, a Stag Arms Model 2T, a Smith & Wesson M&P15 and a Bushmaster. I never had 1 failure in any one of these rifles. I used several oils on them including BreakFree CLP, M-Pro 7 LPX and Froglube CLP. All of these products are excellent lubricants for the AR-15 however I would highly recommend Froglube CLP over the other 2 because Froglube CLP dries after being applied and will not attract dirt and fouling. 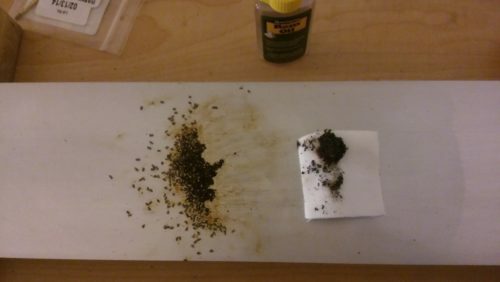 It is amazingly slippery after applied and is dry to the touch and is NON-TOXIC. I believe that Froglube CLP will outlast the lubricity of the other 2 at some point. I have never tested this but I have shot 1,000 rounds out of the Stag Arms 2T without a break for lubrication. It was treated with Froglube CLP. What is Remington Rem Oil Used For? Remington’s Rem Oil is a superior lubricant for firearms or other machinery. Rem Oil is a petroleum based lubricant with a Teflon lubricant added. It not only lubricates but also cleans fouling, dirt and debris from gun actions, barrels and trigger assemblies. Rem Oil goes on wet with a very low viscosity (very thin consistency) but shortly dries and provides a long lasting dry film. I have tested Rem Oil for its cleaning abilities and lubrication and it does very well especially lubrication. It’s very slippery and not does gum up or get sticky with age. I like how thin it is. It seeps into all cracks and crevices and the pores too. 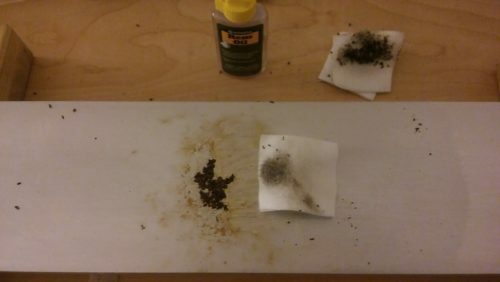 Here’s my gun cleaning test featuring Rem Oil. Here’s the carbon and powder fouling to be cleaned. I soaked the carbon fouling with Rem Oil and let it sit for a few minutes. Then I used a few patches to wipe it clean. You can see that most of the carbon wiped off easily, Rem Oil does clean but not as well as a straight gun cleaner like M-Pro 7 or Hoppe’s Elite. Is there a best gun oil for the AR-15 rifle? I think so. 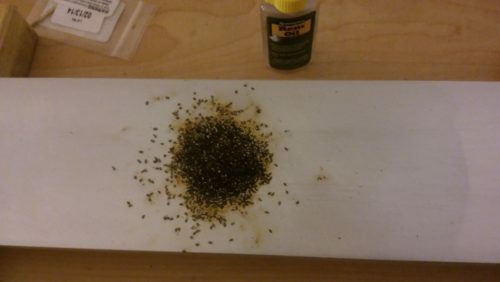 The AR-15 rifle has fairly tight tolerance and so you need a thinner oil that can get into and stay in tight places. I have had 2 AR-15’s (Stag Arms T2 and Smith & Wesson M&P 15) and tried many gun oils on them. Both of these rifles were 100% reliable with zero failures regardless of lubricant. So what gun oil did I like and use? 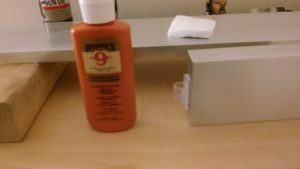 I first used BreakFree CLP for about a year and then switched to Hoppe’s No 9 Synthetic Blend Lubricating Oil. The reason I switched was not because BreakFree CLP failed but because I physically tested the 2 lubricants with 2 pieces of metal and the Hoppe’s No 9 Synthetic Blend gun oil felt a lot more slipperier. Synthetic oils reduce friction and wear more than conventional oils. I want to say one more thing about firearm lubrication and that is that most gun oils are better than CLP’s at lubrication and synthetic oils are better than traditional petroleum oils. If you’re looking for a dry lubricant, Hornady One Shot is excellent. It is extremely slippery and easy to apply. Hoppe’s keeps on pushing the edge with gun maintenance products. Their latest line of high performance products is named “Black”…as in “black rifles”. These products which include the Black Gun Cleaner, Black Precision Oil, Black Copper Cleaner, Black Gun Grease and Black Lubricating Cloths are designed for extreme environments. 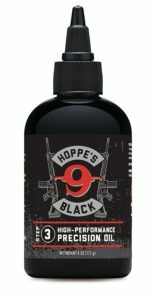 The Hoppe’s Black Precision Oil is a high tech lubricant formulated specifically for combat type environments where hundreds of rounds are fired in a short period of time. The Black Precision Oil has an extreme temperature range of -65 F to 540 F. Semi auto weapon barrels can easily reach the 500 degree mark in no time at all and even surpass this. The Black Precision Oil also has an excellent corrosion inhibitor to protect metal surfaces for long periods of time. Hoppe’s Black High Performance Precision Oil is ideal for AR and AK type rifles where metal surfaces (barrels and bolts) can easily reach 400-500 degrees. If you want to try Hoppe’s new Black Precision Oil, here is a link…Hoppe’s Black High Performance Precision Oil at Amazon.com.